In the Army, military occupational specialty (MOS) 12N is horizontal construction engineer. These soldiers use bulldozers and other heavy equipment to help complete construction projects. They operate all manner of heavy machinery, including backhoes, excavators, and scrapers. In other words, horizontal construction engineers help pave the way for their fellow soldiers. The duties of this job all relate to excavation and construction. Soldiers in MOS 12N drive bulldozers and road graders, as well as other heavy earth-moving equipment to clear and excavate. 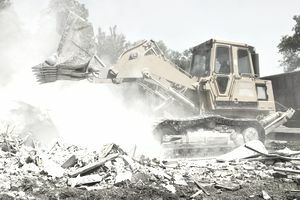 They may also use scrapers to cut and spread fill material, transport heavy construction equipment with tractor-trailers, and assist with combat engineer missions. Job training for horizontal construction engineers requires 10 weeks of basic combat training and nine weeks of advanced individual training. Part of this time is spent in the classroom and part in the field with on-the-job instruction. You'll report for basic training in one of four bases: Fort Benning in Columbus, Georgia; Fort Jackson in Columbia, South Carolina; Fort Leonard Wood in St. Robert, Missouri; or Fort Sill in Lawton, Oklahoma. Most engineers report to Fort Leonard Wood, whereas infantry report to Fort Benning. Soldiers in MOS 12N learn how to operate the different kinds of construction and rough terrain equipment they’ll use in their jobs. They also learn about soil types and how to place grade stakes. For someone with a natural capacity for geology and construction, this job is likely to be a good fit. There’s no security clearance required, but to qualify for MOS 12N, soldiers need a score of at least 90 in the General Maintenance (GM) portion of the Armed Services Vocational Aptitude Battery (ASVAB) test. The subtests for the GM line score are general science (GS), auto and shop (AS), mathematics knowledge (MK), and electronics information (EI). The strength requirement for this job is “very heavy,” since you'll be using heavy earth-moving equipment. Normal color vision is required; no colorblindness is permitted. Soldiers interested in this job should be comfortable working and balancing in high places, as well as climbing. If you suffer from vertigo at all, this job is not for you. The skills you learn as a horizontal construction engineer will help prepare you for a wide variety of careers after the Army. You’ll likely be qualified for work with a building contractor or construction firm, or for jobs with state highway agencies or rock quarries. What Does an Army 88M Motor Transport Operator Do?